I want to first start by saying that you’re in the right place. Here, you will find the best expert information on epilators. As I stated, this is my area of expertise. I use epilators myself as my family and heritage are known for having excess hair on the face and body. These are things that plague me just as they plague other women, so of course, I want to have the best epilator on the market! I love my skin when it’s completely hair free and smooth. But maintaining perfect, smooth skin is not an easy task. I have tried too many products that promise hair-free skin, but do not deliver. An electronic epilator is one of those tools that can do the job. What Does an Epilator Do? An epilator is essentially a bunch of tweezers working together. In other words, an epilator is a machine that actually pulls hairs from your face and body out by the roots, and it does this with motorized tweezers that spin around on a wheel. This might sound scary, and there is some tingling and pinching involved, but for the most part, you will find that the initial pain goes away over time. Epilators work very quickly. I’m sure you don’t want to imagine pulling each individual hair on your face out with one pair of tweezers! Some epilators have many tweezer heads while others have fewer. Epilating and waxing are often put in the same camp, but I’m here to tell you that epilating is way better than waxing. Yes, waxing can work to remove hair, but unless you can afford and have time to go to the salon every week to get it done, you’re going to have a sticky mess on your hands every time you wax at home. The products can be expensive as well whereas epilating only costs upon your initial purchase of an epilator. In addition, you can find more comfortable ways to epilate. All around, waxing just hurts. But epilating can be more gentle once you know what you’re doing. It can be good for people with sensitive skin or allergies to waxes. Finally, you can stop hair from growing back so quickly when you use an epilator. On a mission to find the best epilator, we have rounded up the top available models to find the best one by evaluating and comparing their features and prices. The review starts with a comparison table of all the models reviewed. Our Editor’s Picks are highlighted at the top. Braun Silk-Epil 9 is the best epilator for women in the market. This epilator is the fastest epilator and a powerful one. After extensive research, we have decided to give this product recommendation for the best epilator under $200. The epilator epilates most of the hair from your skin in just one stroke. It has the looks, power, and efficiency. The design of the product is very pretty. You can easily fall in love the looks. This epilator offers a wet and dry system, that helps you to do the epilation with ease. The smart light helps you to find the short hair on your skin and gives you the best epilation result. This is the fastest epilator. Its micro grip tweezers hold the hair and pull out from the root. Even the hair as short as 0.5mm. 40% wider head covers a larger area and epilates the skin faster. It is a cordless epilator. You can use it anywhere and can carry it in your bag. The wet and dry epilator system allows you to use it in the water. The dual speed settings allow you to control the speed level and adjust to your body. The product epilates almost 95% of your skin at the very first stroke. You cannot use the product while it is charging. It can be slightly painful at the first. This is an expensive epilator with great efficiency. The Braun Silk Epil 9579 is our top pick in the existing epilator market. Emjoi Emagine AP-18 is the most powerful epilator in the market. Its 72 tweezers make the epilator faster than any other epilator in the market. It is also a great epilator in medium price, which makes it the best epilator under $100. You can have smooth epilation in lesser time than other epilators in the market. This helps in ingrown hair removal. To check the best price for this epilator, click here. The model has 72 powerful tweezers (highest tweezers in an epilator!) that helps you to epilate much faster than other epilators. It has a dual-opposed head that holds the skin taut and makes your epilation easier. The glide technology helps to move the skin on the skin without irritation. The middle lifting fingers help to lift the lying hairs on the skin. This epilator is very good at removing ugly chin hairs. The ergonomic grip helps to get an easy hold on the epilator. The curved surface easily adjusts to your curved body parts. Reduces the chances of getting ingrown hairs. The dual speed system helps to adjust speed for your face epilation. This is not a cordless epilator. You cannot use it unplugged. The model doesn’t have any wet and dry system. It cannot be used on the face. 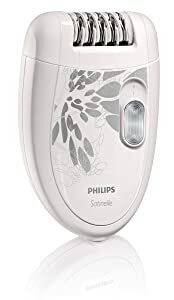 Philips Satinelle Hp6401 is the best cheapest epilator in the market. This does epilation like magic. It is suitable for you if you have a price concern. It can turn out to be the best alternative in a low price range. There could be no comparison to it for such a low price. This is the little guy when it comes to the epilation world. The Philips HP6401 Satinelle Epilator can easily fit into the palm of your hand, but it does wonders for getting rid of even the finest hairs on your legs and other parts of your body. Cheapest epilator with great efficiency. The efficiency cap minimizes the pain in the sensitive areas. 21 hypo-allergenic tweezers keep your skin germs free. The ergonomic grip gives you comfortable hold over the tool. Dual speed system gives you control over the speed. The epilator doesn’t have any built-in light. This epilator takes multiple strokes to have a perfect epilation. This one not suitable for the face. If you really want to try out an epilator but don’t want to spend a lot of money, this is the product for you. Philips Satinelle HP6401 is the cheapest epilator in the current market. This is the best budget friendly epilator. Although it cannot be well compared to the epilators with a higher price range, this Philips epilator still does a very good job. I like the size and shape of this product and the fact that it is also great for sensitive areas. If anyone asks me what is the best hair removal for men? I would say in one sentence, Emjoi AP-18MS Epilator is the one for you. This Emjoi epilator is the best epilator for men in the market, also the fastest one! This is the first, and the only epilator specially designed for men. This is slightly expensive than ladies epilators. But this can pull up the coarse hair from the skin. 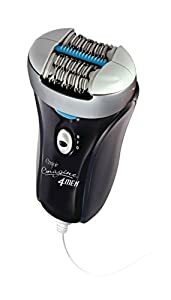 This is a by far the most powerful epilator in the market made for men. YES! It is a specially designed epilator with 72 tweezers, mounted on a metal head. These tweezers help you to epilate a lot faster and efficiently than many other expensive epilators in the market. This tool helps you to save time and money, which you spend in the beauty salon to have a hair free skin. Check for the best price for this Emjoi epilator. 72 metallic tweezers: These powerful metallic tweezers work like magic on the coarse hair on your body. These can pull out the hairs in a few stroke. These tweezers bring out the hairs from the root. You will feel hair free smooth skin. You can have a hair free skin up to 6 weeks. The tweezers can bring out the hair as short as 0.4mm. Ergonomic design: It helps you to balance the epilator well and have a comfortable use. Dual speed: Dual speed levels help you to control speed have a safe epilation. Cool touch metal head: The cool-touch metal head gives you soothing comfort. 17mm disc opening: This 17mm disc opening gives you effective hair removal. Glide technology: Glide technology helps to reduce skin irritation. This also soothes your skin. Dual opposed head: This dual-opposed head holds the skin taut and makes your epilation more comfortable. This can grab a lot of hairs at a time and epilates them. Middle lifting finger: These middle lifting fingers prepare the hair to epilate. They lift the hairs on the skin and makes epilation easier. Silver Ion protection: This keeps the surface antimicrobial protected. This helps you to use the product for a longer period. These give a better result of epilation. 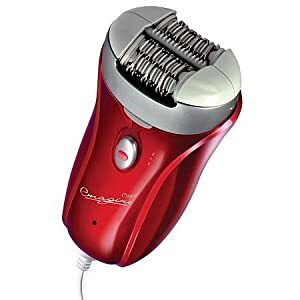 Corded epilator: This is corded epilator. This helps you get rid of the charging problem. Emjoi AP-18MS is a specialized tool for men. This product is designed to pick up the coarse hair from your skin. Its 72 metallic tweezers pull out the hair from their root in just a few stroke. These tweezers are very powerful, and you can have a perfect result of epilation. The tweezer head has a 17mm opening disc. This covers a broad area in the first attempt. 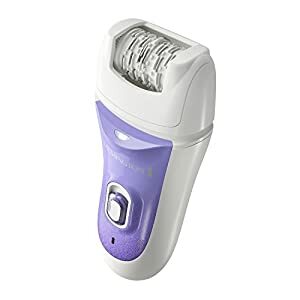 Amazon has got the best price for this epilator, click here to check. This epilator can pick up very short hair like a length of 0.4mm. Its middle lifting finger lifts up the lying hair on the skin and epilates them. This can make your skin stay smooth up to 6 weeks. The dual speed system helps you to control the power of the epilator to reduce pain level. This epilator can be used on your legs, arms, back and on your chest. This will ensure you to have a handsome hair-free look. The epilators cord is much longer than you can reach the hair portion and epilate the area with ease. These make Emjoi Emagine AP-18MS the best epilator for men. Hair removal for men can be a little bit ticklish on some body part. And it might hurt a little bit more on some body parts. But does the best epilation for men. Emjoi AP-18MS is the best epilator for men. This epilator is so powerful that it can pull out the coarse hair from the skin. So this one is for those men who want to have a hair-free perfect glowing skin. If you are a guy and want to make your skin look and feel fabulous, then this is the perfect gadget for you to buy. Braun Silk-Epil 7 is the best selling epilator on the market. This is a really good epilator with a lot of features. The epilator comes with many different interchangeable heads. These help you to have a perfect epilation. This epilator is fast enough to reduce the pain level of the epilation. This gives you the perfectly smooth skin that you always wanted. The bikini trimmer of the epilator is the best part of the product. 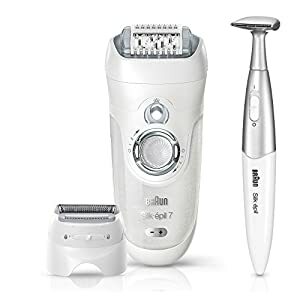 The features & performance together makes Braun Silk Epil 7 Xpressive 7561 one of the best epilator available in the market. The product has 40 close-grip tweezers that bring out the hair as short as 0.5mm. Epilates your skin in fewer stroke. This is one of the best cordless epilators. The batteries run up to 40 mins and it takes 1 hour to get it fully charged. The smart light helps you to find the shortest hair on the skin. There are soft lift tips on the product. These help to lift the lying hairs on your skin. The efficiency cap is specially designed for sensitive area epilation. Dual speed settings give you the control over the speed level. It is fully washable. You can easily keep it hygienic. The smart light doesn’t turn off. It may bother you a little. This doesn’t come with an exfoliating glove to scrub your body. This is an expensive epilator. 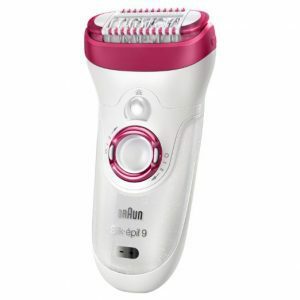 Braun Silk-Epil 9 Skin Spa 9941 is the best skin spa epilator. It saves your time and money and gives you the perfect epilated skin. You can feel the difference in your skin after you use the skin spa head. It helps you to have smooth skin and improves your skin health. You will love your skin and its glow. This is one of the best facial hair removal epilators. You can get a skin spa treatment or hair removal at home with the product. 40 tweezers with micro grip technology help you to pull out the hair from the root. The wet and dry feature helps you to minimize the epilation pain. Massage rollers help to stimulate your skin for gentle epilation. Pulsating vibration helps to reduce the extreme pain level of epilation. The product cannot be run while it is charging. It can take a little more time to epilate your skin. This one is slightly expensive. Because I think Braun 830 is the finest model with loads of features in a minimum price range. It is a great tool for your face epilation and gives the best result of epilation. Braun 830 is a specialized facial hair removal epilator. It is a price worthy epilator that helps you to remove unwanted hair from your face and nourish it. In comparison to other expensive products, you will get the almost same result. You can easily rely on it to remove hair from your face. 4 Weeks of Hair Free Skin: This model gives you up to 4 weeks of hair free skin. That helps you look more radiant for a longer period. Slim Head for Ultimate Precision: The extra slim head of the model helps you to remove the finest hair. So you look gorgeous all the time. You can use it on your eyebrows too. Facial Cleansing Brush: The kit contains a facial cleansing You can use it to make your skin softer. If you put on makeup regularly, then this is the right product for you. It cleanses your skin 6x better than manual cleansing. So you can save your time and make your skin look gorgeous in such an easy way. You can save your money too. Because you don’t have to go to the parlor every time and pay for it. Help to Uproot Hair from The Curviest part: This kit helps you to pick up the finest hair from the curviest part of your body. This ensures you to have hair free smooth face. Battery: The product runs on battery. So you can use it anytime and anywhere. Braun 830 is a mini face epilator and cleansing brush kit which is designed for your skin. This helps you to uproot the hair from your face and cleanse your facial skin pores. You skin radiance would be uplifted using the model. This epilator not only removes hair from your skin but also makes your skin very smooth. You will feel very fresh after using the product. Face epilating can be very painful with other epilation products. But with this Braun 830, you can minimize the intense pain of face epilating. As I researched on the product, I can assure you that you won’t be disappointed with the product. Braun 830’s slim head provides precision and ten micro openings that capture the finest hair from your face. Along with the curviest part of your face. The only con of this product I see is, it has a slim head. That is why it takes a little bit more time to epilate your face. But I can also say that it can be a positive because your face is more sensitive than the other parts of your body. 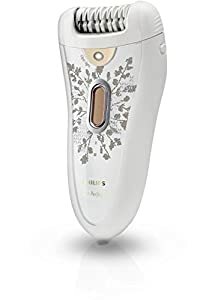 If you are hoping for buying an epilator in medium price range but with the facilities of the expensive epilators, then Braun Silk-Epil 5280 is the best choice for you. Now you might be asking me why the Braun Silk-Epil is one of the medium priced epilators. This product gives you powerful epilation like the expensive models but at a lesser price. And it is a good epilator for the beginners. High-frequency massage system: Braun Silk-Epil5280 has a high-frequency massage system. This helps you to soothe your skin while you are epilating your skin. This also maximizes your skin comfort. 40 tweezers with close-grip technology: The product has 40 powerful tweezers. These 40 tweezers have been engineered to have the close grip to the skin to pull out the hairs of 0.5mm. This ensures you a perfect epilation. The product provides you a long-lasting hair-free skin. It keeps the skin smooth up to 4 weeks. Soft-lift tip: The model has a soft-lift tip. With the help of the soft-lift tip, you can easily lift up the lying hairs and epilate them. Smart light: The smart light of the product helps you to find the tiniest hair on your skin. Speed personalization: The product has speed personalization system. It gives you a comfortable epilation with the adjusting speeds. Washable system: The head of the epilator is fully washable. It is easy to wash.
Corded device: This gadget is a corded one. So it doesn’t consist any battery. You have to use it corded. And forget about the battery life problem. Its 12V adapter supplies power to the device. Cooling glove: The cooling gloves are for your skin comfort. They soothe your skin after epilation and makes your skin feel fresh. These attachments make the epilation easier and comfortable for you. The product also includes a carrying pouch. The model gives you a faster epilation than any other epilators in the market. This helps you to pull up your short hairs like 0.5 mm height. This ensures you to have a perfect epilation. The model has got 40 powerful tweezers. The tweezers are so powerful that it can easily lift up even the shortest hair with lesser pain. Silk- Epil 5280 has a soft-lift tip. This helps you to lift up the lying hairs of your skin. And the tip helps you to feel no pain while it’s lifting the hairs. The smart light of the model helps you to find the leftover hair on your skin. This feature is specially made for you to have a perfect epilation everytime you do. The corded feature helps you to use it easily. You don’t have to run out of the charge. And you don’t have to charge it very frequently while you are using it for epilating your skin. It has a speed personalization option. It makes the product more amazing. You can manage your speed level to epilate your sensitive areas. This model is an easy to use model. You can use it according to your comfort. And you don’t have to be an expert to use the product. It is perfect beginner model. This one is easy to clean. Your skin gadgets should be safe and hygienic. Your skin is much sensitive than any other part of your body. So you should maintain the hygiene of your skin. This easy to wash epilator gives you to maintain that hygiene. Click here for more reviews on Amazon. The biggest negativity I can point out for the product is that it is not a wet and dry epilator. And it is not a cordless epilator. But it does a good job like the cordless one. Sometimes better than the cordless one. You don’t have to charge it very frequently like the cordless epilators. The best alternative to this product could be the Philips Satinelle HP6401. If you have a price concern, then you should go for it. Here is another wet and dry epilator that I really love. The wet and dry epilators make it so comfortable and easy to use whenever you take a shower or a bath. I also like the design of this product. It has a cute gradient color scheme that is feminine and fun. This particular Panasonic epilator, ES-ED90-P has a lot of features that make it a really good epilator. That is why I recommended it on my top epilators list. The model has introduced a hypo-allergenic blade specially designed for sensitive skin. If you have sensitive skin, then you are hitting the right product. This is a major pro of this product. Most of the expensive epilators don’t offer such features. So it is totally a price worthy product. 60-degree angle head: 60-degree angle head helps you to use it easily. It helps you to adjust the epilator to your skin avoiding any skin problems. Nickel-free hypo-allergenic blade: This blade helps you to have a safe shave. It keeps the blade hygienic, and your skin germs free. So sensitive skin doesn’t get irritated. Pedicure buffer: The model has a pedicure buffer. So it doesn’t only shave your body it also soothes your skin. It surely helps you to save money and time. LED built-in light: This built-in light is for your smooth epilation. It shows the hidden hairs. So you don’t have to get embarrassed in front of anyone and walk like a glam girl. These caps help you to bring out the inner beauty of your skin. Wet and dry feature: The product gives you the opportunity to use the epilator while having a bath. It helps to get the best epilation result. Pivoting head: The pivoting head gives the option to get smooth hair free skin. Panasonic ES-ED90-P is an inexpensive model. This is durable and very easy to use. It has a Nickel-free hypo-allergenic blade for a safe shave, and it is perfect for sensitive skin types. So you don’t have to be tensed if you have sensitive skin. The model has a pedicure buffer. So you don’t have to spend your bucks and time to have your pedicure done. The model has 48 rotating tweezers that provide a very fast epilation. And with the 6 adjustable caps, you can easily turn it into a shaver or a trimmer. I have got the best price on Amazon for this epilator. This epilator is slightly less painful than other epilators. You will love the product if you have skin problems. If you still feel the pain unbearable then use it in your bath. Panasonic epilator, ES-ED90-P is a cordless wet and dry epilator. And it will minimize your pain. It is 100% waterproof. So there is no worry to use it in the water. The product also has a built-in light. You have the advantage to find the finest hair from your skin. This built-in light helps you enhance your skin beauty. The one con I can see is the built-in light doesn’t switch off. It stays on all the time whenever you use it. This product is also super great because it comes with so many attachments! If you want to do a lot of things with your epilator, then this is the product you need. You can use it as a spinning pumice stone on your feet, and you can even trim hair. I love this product for getting rid of hair on the face and in the bikini area. Philips epilator, Satin Perfect HP6576, is one of the high range epilators in the market. So you might ask me why should you buy it? I think its features and performance does answer your question. Though it is slightly high priced, it is still worth the money. Let me tell you why. The product has ceramic discs that help you to have a nourishing smooth skin, but other expensive epilators don’t have one. And it has an active hair lifter. That helps you pick up the flat-lying hairs. If you used an epilator before, you would understand the problem of the flat-lying hair. This epilator does a perfect job epilating the flat-lying hairs, unlike the other models. This epilator truly can give you satin skin. I had a model I did makeup for tell me once that this is what gave her her glow. She used it all over her legs before photo shoots, and it really did give her silky smooth skin on her legs and arms. In addition, when I used to live in Spain, I noticed that a lot of Spanish people often epilate to get rid of body hair. A lot of them used this product! Hypo-allergenic ceramic discs: The item has got 32 textured ceramic discs. That gives you perfect hair-free skin in only one stroke. Active hair lifter: The model has active hair lifter that vibrates and helps youto lift the flat-lying hairs. This ensures you perfect hair-free skin. Active massage system: This amazing feature helps you to massage your skin while you are epilating. Washable head: The washable head gives you easy to clean tweezers. The most other epilators don’t give you such features. So you can have a safe, hygienic epilation. Opti-light: This item has an opti light, that helps you to find the thinnest hair on your skin. So you can have a smooth skin. This product box also consists a cleaning brush and a pouch. Charing time: The Hp6576 usage time is up to 40 min. And it can be fully charged in 1 hour. Warranty: The product gives you 2 years warranty. Its Hypo-allergenic textured ceramic discs are the best feature I have seen so far. These discs got 32 textured tweezers (more than 40 tweezers are better). And most importantly it epilates your skin in one stroke. This is done with the help of the powerful discs. The luxury tweezers are ideal for your eyebrows grooming. This model is a cordless epilator. Its charge lasts up to 40 min. But the most amazing part is it gets fully charged within a short time. Do you know how short the time is? Yes, it gets fully charged in 1 hour. Where other epilators (see comparison chart) need 3-4 hours to get a full charge, this amazing gadget gets it done in only 1 hour. The product got a removable head. This feature helps you to clean up the tweezers with ease. The hygiene of an epilator is a must for your skin health. The model helps you to keep it hygienic with its removable head. Philips epilator, Satin Perfect Epilator HP6576 is a very fast epilator. This does the epilation done in lesser time than many other epilators. Your legs can be done in 20 mins when you get used to it. And it lasts up to 3-4 weeks. So you don’t have to redo it very often. The two-speed points give you control over your epilation. You can change your speed level to avoid intense pain in a sensitive area. This gadget comes with 2 years warranty. So you surely can use it without worrying about the product getting damaged. For more information about price check Amazon. The only problem users pointed that some of them has problem epilating their face with the product. Those users have mentioned they didn’t use the 2 two speed option to maintain the speed to epilate their face. You can easily change the speed, and it will soothe your skin during face epilation. Remington epilator, EP-7030, is a really good epilator with a lot of features. This is one of the best epilators in the market. It has a lot of features that help to epilate the body. It does a really good epilation for you. This is one the powerful epilator on the current market. You may ask me why it is the one of the best? This epilator does a really good epilation job. This has loads of features that help to epilate the body with efficiency. And it is one of the low-cost epilators. The epilator comes with a lot of feature in a reasonable price. 40 Tweezers: This epilator has 40 tweezers that help you to uproot the hair from your skin. 40 tweezers help you to bring out the finest hair. Stainless tweezers: The tweezers help to keep the skin smooth for the long period. As the tweezers remove the hair from the root, the hair growth would be slow. As a result, you can have a hair-free skin for up to 4 weeks. Wet and dry: This epilator has a wet and dry feature. The wet and dry feature helps you to reduce the pain of epilating by using it in the shower. So you can use it under the water during bath time. And have a silky smooth skin for a long time. Adjustable head: The model has an adjustable head that can easily adjust to your body. For this feature, you can easily use it in any part of your body without any adjusting problems. Detail light: The detail light feature is icing on the top. With this feature, you can easily find the finest hair on your skin. So you can have a hair free skin. The more interesting part is when you epilate your skin you can easily miss one or two hair in the middle. But with the help of this detail light, you can easily find it and uproot at once. Angle cap: This product has a perfect count angle cap. This ensures optimal tweezing angles. That helps you uproot the hair properly. Cordless epilator: Remington EP-7030 is a cordless epilator that helps you to use it anywhere and anytime. The cordless makes it more portable and easy to use. This caps makes your epilation easier for you. And if you are using an epilator for the first time than it surely would be helpful for you. Washable head: Now if you are thinking about washing system of the head, then I would say there is no need to worry. The head of the epilator is washable. You can easily wash it and keep it hygiene. Dual speed system: Its 2 speeds make the epilation faster. So that you can less feel the pain. Anti-slip grip: This epilator has an anti-slip grip. So, as a result, it is comfortable to use it, and there is less risk of hurting yourself. Stand by time: This product has 40 mins of standby time if it is unplugged. So u can use it without connecting to the power source. These extra tools help you to do epilation easily. Remington EP-7030 face and body epilator is one the best Remington epilators available. It is a cheap tool for a woman to enhance her beauty. It is a very efficient accessory for any women. You can get the best price of Remington epilators from Amazon. You would ask me, why should I buy it? The answer is, it is cheap and very efficient. Because it delivers what, it promises. 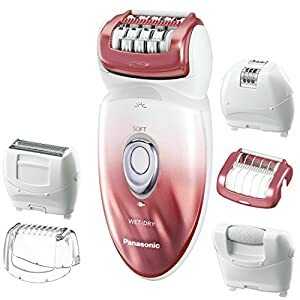 It may be not the fastest model (click here to see the fastest model), but Remington epilator does a very good job according to the price and capacity. It removes hair from the root without breaking the hair so that one can have a very smooth skin. For this reason, a woman who uses an epilator to have a smooth skin cannot demand more. The 40 tweezers are not that powerful but bring out the finest hair. You can have a complaint that it is slow at the beginning. But you should know that every epilator has a slow pace at the beginning. Wet and dry Remington epilator, which helps you to ensure the minimum pain during epilating. You can use it while having a shower. Which minimize the extreme level of pain of epilating. EP-7030 has detailed light helps you to reveal the finest hair on your skin. So that, you can have a silky smooth skin. The only con is it is not that fast and powerful in compared to the expensive ones. But it does a very good job in such a medium range. We all know that mostly women use epilators, so I am first going to talk about the top epilator for women. 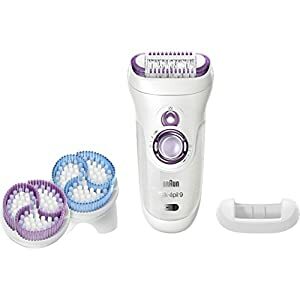 The best rated epilator for women is definitely the Braun Silk-Epil Wet and Dry Cordless Epilator. This product can be used in the shower or bath when your skin and product are wet, but it can also be used on dry skin if you prefer that. 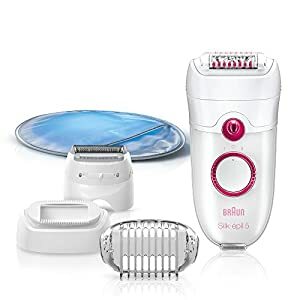 The product has super fast moving heads for quick and painless epilation, and the comfort grip makes taking care of body hair a breeze. I also love the safety feature that does not allow the unit to be used when it is still plugged in. The charged battery runs while you use the product in the shower or bath. This product is super effective, but it is a little on the expensive side. I say that it is well worth the price! We must remember to talk about men because men can certainly use epilators too! Whenever men ask me what the top rated epilator for men is, I tell them the Emjoi AP-18MS Emagine Epilator for Men. The Emjoi AP-18MS Emagine Epilator for Men actually looks like a product for men, and a lot of men really appreciate that. In other words, it is not pink or baby blue! But this product doesn’t just look good. It works too. In particular, it works for the coarse hair that men tend to have on their bodies. A lot of men want to know how they can get rid of hair on their bodies that may embarrass them. This hair is usually on their neck, back and shoulders. The Emjoi AP-18MS Emagine can take care of these problem areas. In addition, this product features a cool to the touch, metal head and 72 individual sets of tweezers on the motor. You can choose from two speeds with this product. But it easily on Amazon. Finding the perfect epilator for facial hair can be a challenge because the hair and skin on your face is different than the hair and skin on your body. Your facial skin is delicate, and some epilators with a lot of tweezer heads can pull and tug at the skin, which can make it break out in hives. You need a delicate product that effectively pulls out those pesky facial hairs but does not irritate your skin. In general, I believe that the best facial epilator is the Emjoi Epi Slim Epilator – Battery Operated. It glides right over your delicate skin without problems. If you want to learn more about the specific face epilator reviews, just go to this page. I have compiled my favorite facial epilator reviews here and more about the features of these products. Everyone wants to have smooth legs, and that’s where epilators for legs come in. Epilators for legs are especially designed to help with hairy legs. They are great because instead of cutting your leg hairs off like a razor would, they actually pull the hairs out by the roots, and this creates a longer lasting smoothness. My favorite epilator for the legs is the Braun Silk-Epil Wet and Dry Cordless Epilator. This is a great epilator for the shower or bath, and that definitely reduces pain on the legs. If you want to learn more about getting smooth legs with a leg epilator, simply go here to read all of the reviews based on epilators for legs. You may not know this, but you can actually use epilators on your underarms as well! This is a wonderful bonus for people who get sweaty underarms and body odor as soon as they form just a little stubble in their armpits. It also makes hair removal much easier overall. There is more information about underarm epilators on this page, but for now, I will tell you that my favorite epilator for underarms is the Braun Silk-Epil Wet and Dry Cordless Epilator. Again, I love this epilator because it can be used on the coarse hair in the underarms and in the shower or bath if you desire. A Brazilian is a type of style where you do not have any hair near your bikini area. It can also be called a full bikini wax. To do this with an epilator, you will need a special type of product. There is a lot more information on this page. Here, you can read all about epilators for Brazilians. But I can also give you my favorite Brazilian epilator. It is the Panasonic ES-ED90-P Ladies Wet and Dry Epilator/Shaver. I like this product because it can be used in the shower or bath, and really, when you are going to be epilating your bikini area, you need water! If you don’t do this part of your body with water, it will definitely cause you a lot more pain. The Panasonic ES-ED90-P Ladies Wet and Dry Epilator/Shaver can be used wet or dry on any area of the body. If you want to use it in the bikini zone, this product even comes with extra attachments that make this process super easy. Often, you just want to be able to have the top rated epilator for both body and face. In other words, you don’t want to have to purchase a different epilator for every different part of your body. This makes complete sense. If this is the goal you have when it comes to purchasing an epilator for yourself, I recommend the Panasonic ES-ED90-P Ladies Wet and Dry Epilator/Shaver again. This epilator is more than just a hair remover. It can be used as a pumice stone for your feet and a shaver. I love it for the face because it has a gentle setting that takes into account the delicate skin on the face. Find more information about the best epilators for face and body and permanent body hair removal here. Even the best hair removal cream is no match for an epilator. Depilatory or hair removal creams are costly and contain a lot of bad toxins that will go directly into your skin. They smell bad, and they are a big mess to use as well. On the other hand, epilators are quick and easy, and there’s no mess involved. All you need to do for cleanup is brush out any hairs that have gotten into the tweezer heads. It takes about 10 seconds. The first thing that you will want to think about when it comes to purchasing an epilator is how much you are willing to spend. You will see in the following epilator reviews that some of these products can get a bit pricey. But that does not mean that you can’t find one that fits your budget. You will also want to consider whether you want a battery charged epilator or the one that needs to be plugged in to be used. Figure out if you want one that can run in the shower or bath as well. Often, these are more comfortable because you can use them wet, but they may cost more. You should look at the speed levels of the epilators you’re considering and how many heads they have on them too. Lastly, remember that the best epilator for someone else may not be the best for you, so read your reviews carefully! Below, we’ll talk a little bit about the different types of epilators. Basically, there are three different types of epilators. Corded epilators must be plugged into be used, cordless epilators don’t need a cord and can carry a charge but can’t be used wet, and finally, waterproof epilators can be charged and used in the shower or bath. The corded epilators are those that must be plugged in to be used. This is a nice feature because you know that your charge will never die. But the cord can be annoying, and you certainly cannot use this type of epilator in the shower or bath. The best corded epilator is the Braun SE3170 Silk-épil 3 SoftPerfection Epilator. I absolutely love this beauty appliance. One of the reasons that it is so great is that it is small enough to fit into your palm. This makes it great for traveling if you are someone who is always on the go. In addition, this product has great reviews for making your skin feel silky soft and getting rid of even the smallest baby hairs that tend to lay flat against your skin. The cordless epilators are those that do not need to be plugged in to be used. They come with a charger that you can use to add juice to the battery. This makes them super easy to use anywhere you want to, and with some cordless epilators, taking them in the shower or bath with you is an option. I like this feature, but a negative is that you always need to remember to charge them. The best cordless epilator is the Braun Silk-Epil Wet and Dry Cordless Epilator. 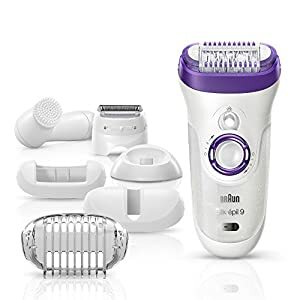 You will be able to read more about this product in the epilator reviews below, but for now, I’ll just tell you that this is a great product that can be used wet or dry and truly makes your skin silky smooth. Waterproof epilators are a type of cordless epilator. These are great because using a waterproof epilator in the shower or bath lessens the pain by a large margin. In addition, cleanup is very simple because you can allow the hairs to go down the drain if there aren’t too many. This is usually not a problem. The best waterproof epilator is the Braun Silk-Epil Wet and Dry Cordless Epilator. Well, it’s actually the best for a lot of reasons. First of all, not many epilators can go in the shower or bath with you, and this one functions perfectly in either one. Honestly, I have used epilators in both wet and dry settings, and I much prefer the wet settings. This is a great product from Braun. Panasonic epilators are some of the best as well. You may know about the Panasonic company because they make tons of different types of products. For example, you can get a Panasonic camera, a Panasonic television or a Panasonic epilator. Their products are top quality, and I’ve never had a problem with one of their epilators. My favorite epilator from Panasonic is the Panasonic ES-ED90-P Ladies Wet and Dry Epilator/Shaver. Next to the wet and dry Braun model, this is one of the best wet and dry epilators out there. It comes with a lot of great features that allow you to trim and groom your bikini line very easily. In fact, that’s one of the top reasons I like this product. You will definitely be reading some key Emjoi epilator reviews below in the reviews section. My favorite product from this company and what I believe to be the best Emjoi epilator is the Emjoi Epi Slim Epilator – Battery Operated (Latest Edition). But this company truly has so many excellent models to choose from that it can be hard to choose. 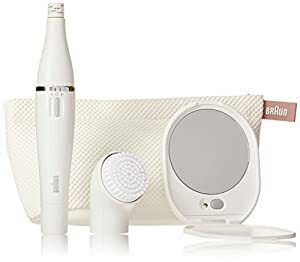 I really like the Emjoi brand because it has been around for many years now, and they focus almost all of their product base on epilators. Unlike some of the other brands listed here, Emjoi does not mess around in other areas with other types of appliances. You can find just what you’re looking for with Emjoi epilators. Philips is a company that is renowned for creating great electronics of all types. They make televisions, speakers, electric toothbrushes, epilators and more! The company was created in 1891 in Amsterdam, Netherlands. The Philips Satin Perfect Epilator is my favorite epilator from Philips. The full name is the Philips HP6576 Satin Perfect Deluxe Epilator, and it does great work at getting rid of those pesky hairs anywhere on the body. That’s because Braun actually makes one of the best epilators of all time! You already know my favorite epilator from reading the Braun Silk Epil 5 reviews above. The Braun Silk Epil 5 is not only the best Braun epilator, but it is the — period! As for the company, Braun was formed in 1921 in Germany by a man named Max Braun. They make a number of products. The Epilady EP-810-44 Speed Corded Epilator is my favorite of the Epilady facial epilator family. You will see that the Epilady Legend and Epilady Legend Rechargeable reviews on Amazon are all praising of the products from this company. In fact, I have also written an Epilady epilator review for this product because I like it so much! Epilady is one of the top producers of epilators in the world. They started creating epilators in the 1980s when they were first becoming very popular for women, and they have a number of amazing models to choose from. You may have already seen a Remington epilator review on Amazon, but I will speak a bit more about the brand. Remington Products is a maker of shavers, epilators and other haircare products. The company began in 1816, but the haircare products that they made didn’t start until 1937. They first started making electric shavers at this time. In the Remington category, I really like the Remington Smooth and Silky Full Size Epilator. I am now going to explain how to use an epilator, but I want you to remember that there are many different types of epilators, so the directions for one unit might be different from the directions of another unit. In general, you will need to start with clean skin. In other words, never use an epilator when you have lotion or any type of product or oil on your skin. The skin should be clean. In the case of wet and dry epilators, you can have your skin be wet, but never have wet skin when using an epilator that needs to be plugged in. Ideally, you will have hair that is at least 1/8 of an inch long. This is the optimal length for the tweezer heads to be able to pull your hairs out by their roots. Before you start tweezing with your epilator, make sure that you are holding your skin taut with one hand. This will stop the product from grasping your skin and tugging on it. Be careful when you go around areas that have extra skin, such as under your knee or on the opposite side of your elbow. Always hold your epilator at a 90 degree angle to your skin when you are epilating. There is no need to press down on the skin, the heads of the tweezers should just sweep over your skin and barely touch it. You should move in the opposite direction of your hair growth. Move steadily, but don’t go too fast or you might miss some hairs. In some cases, you will need to pass over areas more than once. Here’s a great video on how to use an epilator. As you see, it’s very simple. Now, let’s discuss discomfort when epilating. For some women, this is a problem. I would like to say that epilating never feels uncomfortable, but that wouldn’t be true! It is definitely bearable, but it may not feel good. Fortunately, that’s why there are things like numbing cream. You should also know that using an epilator when your skin is wet might be less painful. Try to also look for the best epilator for coarse hair if you have thicker hairs wherever you will be epilating. Using an epilator created for thinner hairs can be more painful and less effective if you have coarse hair. Finally, you may be wondering how to prevent ingrown hairs. This is a constant issue for people who epilate, but the solutions are really quite easy. First, you’ll want to make sure that you always have clean skin that is free of product before you epilate. Exfoliate beforehand when you can, and always exfoliate after the process as well. You can also find some ingrown hair serums and sprays to use during the process. This helps unclog pores, which can be a problem that causes ingrown hairs. Different types of epilation head: The epilator you choose for yourself should consist of multiple changeable heads that can adjust to your different body parts. It is very necessary to have different epilation heads. It can help you epilate the different part of your body. Dual speed settings: The epilator should have dual speed settings. The dual speeds can help you with speed control. Speed control is very important. Because It helps to epilate your sensitive areas with ease. Cleaning tools: The epilator should have a good cleaning tool. Otherwise, it might become unhygienic and harm your skin. Powerful tweezers: The epilation head should have at least 40 powerful tweezers (Emjoi epilator has 72 tweezers). Tweezers are the most important part of an epilator. Powerful tweezers help you to reach the hairs and pull it out perfectly. The whole epilation result relies on these tweezers. It is very much important to ensure the tweezers are powerful enough to epilate your hairs. A good grip: The epilator must have a good grip. Or else it would be uncomfortable for you to epilate your skin with such an uncomfortable epilator. An easy to charge system: Good epilators always have an easy to charge system. It is essential for a perfect epilation. A good charging system and battery run on time are always an important feature to look in epilators. Smart light: Many epilator comes with a smart light. It helps to find the hairs on your skin and gives you a perfect epilated body. It can be a good feature to look in epilators. Wet & Dry: A wet and dry epilator is always on first preference. It helps you to epilate your skin in the water. This minimizes your pain and leaves your skin smooth, glowing. Hair removal for women is always a painful job. But epilators are making our life easier. Using an epilator is not a big task. I would recommend epilator vs waxing. It is easy to use if you follow some simple epilation rules. Here I am going to let you know the simple epilation rules step by step to make your epilation enjoyable. Choose the best epilator for you: The most important part of your epilation is to find the perfect epilator for you. If you still didn’t find your perfect epilator, then you can look for one in my epilator reviews comparison chart. It may help you to find the best for you. If you want a cheap epilator, then you can go for Philips Satinelle HP6401. But if you want the best then I would recommend you to have a look on Braun Silk-Epil 9. It is the best one in current market. Scrub or exfoliate your skin: This is a very important part of epilation. If it is not done properly then you can have a chance of getting an ingrown hair. To avoid the chances, you should exfoliate your skin properly before you epilate your skin. Earth Therapeutics Hydro Exfoliating Gloves are specially designed to exfoliate your skin. It helps to remove dead skin cells from your skin and makes your skin feel fresh. You should exfoliate your skin every 2-3 days. This will help you to prevent ingrown hairs and also help you in ingrown hair removal. How to hold the epilator to your skin? : Hold the epilator 90 degrees angled to yours. Don’t press the epilator to the skin. The tweezers will have a hold on the hairs and make them come out by the root. If you press it too deep then it might hold your skin and damage your skin cells. It is very important to hold it the right way. Otherwise, you will hurt yourself. Stretch your skin and hold: Stretch your skin & hold if you don’t want to pinch your skin. This will help you with the pain and help you to have a perfect epilation. Stretching your skin with your hands will make your epilation easier and comfortable. Use the epilator against the growth of your hair: Use your epilator against the growth of the hair. This will help you to uproot your hair properly. If you don’t do so you might cut the hair, not uproot it. Do the epilation slowly: When you epilate your skin you must have patience. This will help you to have the perfect epilated skin. Give much time for epilation to get the best result. Doing it in a hurry might hurt your skin and damage the skin cells. How to reduce the pain? : Epilation hurts. This is the truth. But you can reduce the pain level. The shorter hair hurts less. You should trim your hair before you epilate, then you can minimize the pain level. Wet and dry settings help to reduce the pain by using the epilator underwater when your skin pores are open. This hurts a lot lesser than dry epilating. Have a clean epilator: Having and keeping a clean epilator is very important. You can have a safe skin if you can have a clean epilator. Using a clean epilator is a must for your skin health. Epilate during night time: Epilating during night time can make your skin look more beautiful the next day. No there is no magic. The thing is, epilating your skin might leave your skin reddish for a few hours. So it is wise to epilate your skin at night and have a beautiful glowing skin the next day. Using an epilator can make a big difference to your life. It saves a lot of money and time. If you shave your skin, then you have to redo it every 3rd day to keep your skin smooth. But epilators help you do it for a longer period. It keeps your skin smooth for up to 4-6 weeks. With an epilator, you don’t have to pay a lot for your hair removal and smooth skin. Now, we come to the final part of buying an epilator for yourself. It’s time to make your choice, and this can be hard! With all of the options you have out there, you want to ensure that you find the epilator that is right for your needs. Having smooth skin is about more than just feeling like you are getting the job done where hair removal is concerned. It’s about feeling good and positive about yourself so that the rest of your life can fall into place. Remember, feeling beautiful on the inside has to do with feeling beautiful on the outside too! With the perfect epilator, this dream becomes a reality much easier, and that’s why I’ve created this review guide. I hope you find it useful and that you can locate the epilator you have always dreamed of having! Thank you again for visiting!